Ayele Forde of the Oregon Ducks celebrate their Pac-12 victory against the Arizona Wildcats at Levi’s Stadium on Friday in Santa Clara, California. College football fans aren’t habituated to the rhythm of a playoff — at least not in the same way college basketball fans are before the NCAA tournament. But the games Saturday and the selection committee’s choices Sunday will determine the four teams that enter the first-ever college football playoff. 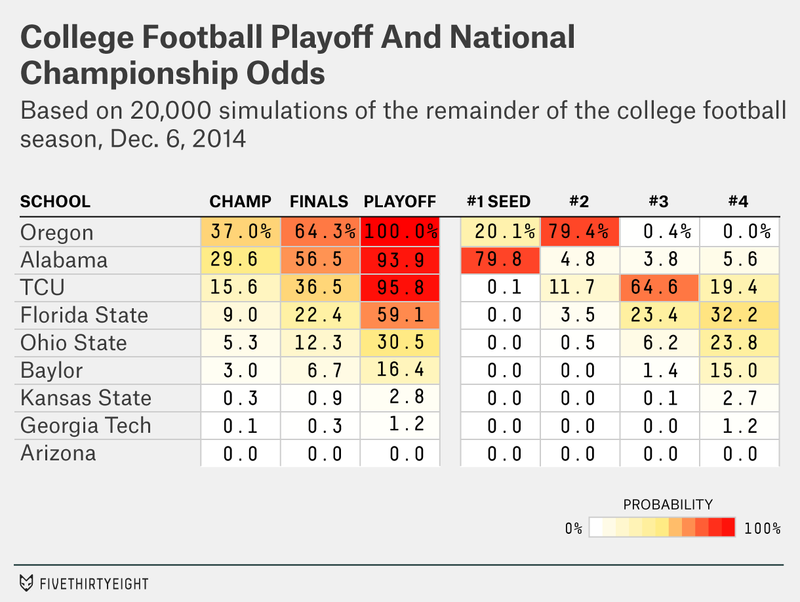 FiveThirtyEight will be here throughout the weekend to update our forecast on which teams are most likely to make it. The math has become simpler after Oregon’s emphatic 51-13 victory Friday night against Arizona in the Pac-12 championship game. Instead of seven teams competing for four positions, there are now effectively five teams — Alabama, TCU, Florida State, Ohio State and Baylor — competing for three slots, with Oregon having secured its position and Arizona out of the running. It’s become crowded at the top. No. 1-ranked Alabama is an 82 percent favorite to beat Missouri in the SEC championship, according to ESPN’s Football Power Index (FPI). And the Crimson Tide are more likely than not to make the playoff even if they lose to Missouri. Third-ranked TCU probably won’t make the playoff if they lose to 2-9 Iowa State. But they’re 97 percent favorites to win the game, per FPI. Crazy things can happen in college football — but if the Cyclones win, it would be perhaps the most memorable college football upset since Appalachian State beat Michigan in 2007. Oregon’s win is also modestly bad news for the teams ranked No. 5 and 6 entering the weekend, Ohio State and Baylor, because they now have one fewer opportunity to leapfrog other teams in the rankings. 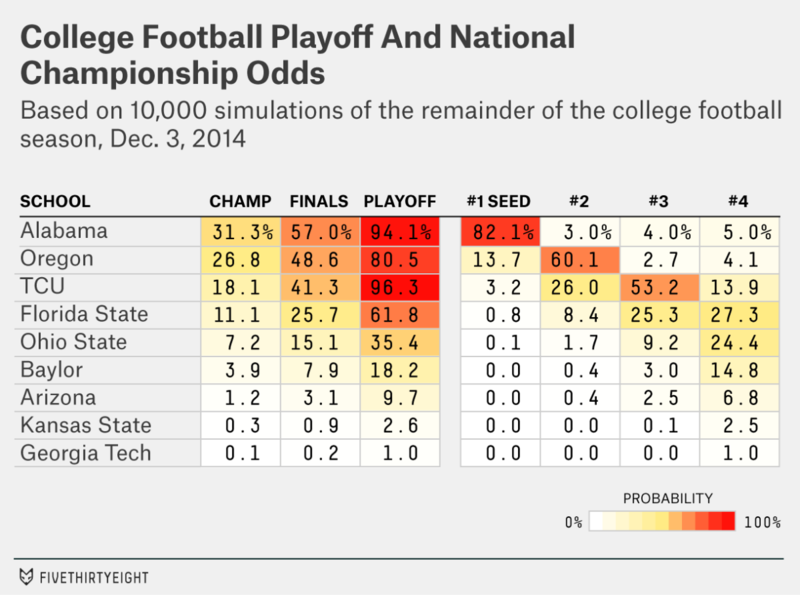 Ohio State’s probability of making the playoff dropped to about 30 percent from 35 percent after Oregon’s win; Baylor’s declined slightly, to about 16 percent from 18 percent. Still, Oregon’s gain came mostly at the expense of Arizona. The result wasn’t a total disaster for Ohio State and Baylor, in part because an Arizona win would have created a mess of its own. Arizona, No. 7 entering the weekend, would have had an argument for making the playoff if it beat Oregon. Oregon might have had an argument even with a loss. But Oregon won. Could the Ducks wind up with the No. 1 seed? They almost certainly will if Alabama loses to Missouri. Otherwise, they’ll probably stay at No. 2, according to the model. But the FiveThirtyEight model is calibrated based on a historical analysis of voting in the Coaches Poll. The playoff selection committee has been a bit more aggressive so far in promoting teams after dominant victories. Perhaps if Alabama wins clumsily against Missouri, the Ducks could overtake it. Either way, it was a happy Friday night in Eugene.